We offer a large variety of micropipette holders. Our popular ones are stock items. Custom holders can be manufactured on demand, but may require an additional setup fee. Please call for quotes on custom micropipette holders. We also offer tips on selecting micropipette holders and half cells. Optional handles (for some varieties) allow for easy manipulation. Handles are sold separately. We offer a large variety of microelectrode holder with a right angle connections. See selection. WPI’s microelectrode holder-half-cells couple fluid-filled glass micropipettes to high input impedance amplifiers. 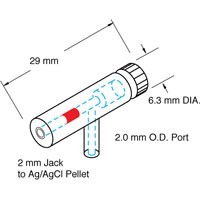 A Ag/AgCl pellet (or a silver wire) molded into the holder body provides stable potential. Electrical connection is made via male 2 mm pins or female 2 mm sockets. The pipette may be mounted axially or at right angles to the holder. Pipettes are held with screw-caps or rubber gaskets (without caps). Filling WPI microelectrode holders with electrolytes containing chloride results in stable electrode potential. Suitable electrolytes include KCl, NaCl and CaCl2. Holders are supplied for standard WPI single capillary tubing of 1.0, 1.2, 1.5 and 2.0 mm outside diameters. (Call WPI regarding custom designs for other glass diameters.) The holder style you select will depend on your experimental application, space, and instrumentation. Determine the required electrical connection on the holder: for example, if you wish to connect the holder to a 2 mm pin you should select a holder equipped with a 2 mm jack. Most WPI probes require a holder equipped with a 2 mm jack. Decide on the required alignment of the electrical connection: either in-line with the glass pipette, or at a right angle to it. Space considerations in your experimental setup and requirements imposed by other pieces of equipment typically determine which alignment is appropriate. 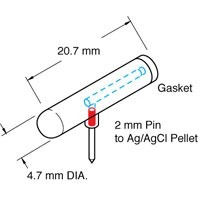 Determine if you want to hold the glass pipette by a rubber gasket (e.g., MEH1S) or a screw-cap (e.g., MEH3S). Rubber gaskets offer easier insertion and removal of glass pipettes whereas screw-caps provide more secure mounts for micropipetters. Choose a holder with either a silver wire or a silver/silver chloride pellet for the metal/liquid coupling. Silver/silver chloride pellets provide a more stable low-noise baseline which is important for low-noise DC recording. 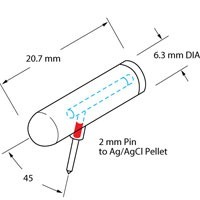 Pellets require the glass pipette and holder to be free of air bubbles to achieve a good connection. Silver wire holders are durable and are easier to use when the holder is equipped with a pressure port because the fluid in the pipette does not have to be filled to the top of the pipette to achieve a good electrical connection. Choose a holder equipped with a pressure port only when you want to pressure inject liquid from the pipette. Two types of ports are available: 2.0 mm O.D. and standard “syringe-style” Luer. The Luer port is often recommended because it makes assembly and disassembly much easier. Quick-connect Luer fittings for four common sizes of tubing (1⁄16", 3⁄32", 1⁄8", 5⁄32" I.D.) are included with each Luer-equipped holder. Some non-WPI preamplifiers or headstages cannot be mounted on micromanipulators. In such cases, a holder equipped with a rod (e.g., MEH8) permits the holder to be conveniently mounted on a micromanipulator. Finally, remember to specify the O.D. of the glass you will be using when you place your order. MEH6RF/SF is designed primarily for use with the Model 900A Micropressure System; EHB1 for use in electrode beveling; and MEH3SW for microtitration of chloride with a silver wire as the electrode and a solution of silver nitrate filling the holder. MPH models do not contain Ag/AgCl half-cells and are used for pressure injection of substances through microelectrodes. PicoNozzle, used for pressure injection with PV800 Series PicoPumps, includes an MPH6S holder — which may also be used to couple a micropipette to a syringe.